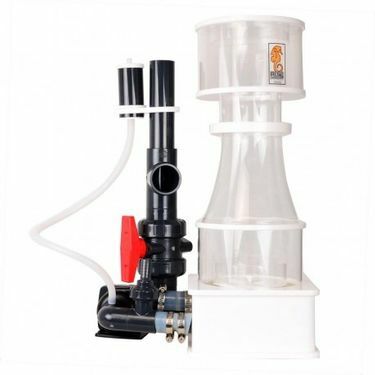 The RLSS Protein skimmers are conventional skimmer with an unconventional pump. The Waveline DC 6000 pump performs both water delivery and water fractionation for the protein skimmer. These pumps are DC which employ a speed controllable current. This allows users to select from six preset RPMs via the Waveline pump to tune the skimmers performance on demand. The pump also features a unique 30 minute feed/service shutoff timer which restarts after 30 minutes. The pump employs a soft start, which means the pump ramps up over time to ensure longevity. All skimmers include the following - Air Silencer, customer venturi intake and all the silicone tubing required. Assembly should take less than 10 minutes for this picture perfect skimmer. Each needle wheel features a 2" diameter with short shaft which reduces imbalances and noise/vibrations. These skimmers run quiet and cool. Running Depth: 20-25cm to effectively run the skimmer without pulling air. L-8-e External Skimmer with Waveline DC6000 pump has not been evaluated yet.